When the map function starts producing output, it is not simply written to disk. Each map task has a circular memory buffer that it writes the output to. When the contents of the buffer reach a certain threshold size, a background thread will start tospill the contents to disk. Map outputs will continue to be written to the buffer while the spill takes place, but if the buffer fills up during this time, the map will block until the spill is complete. Before it writes to disk, the thread first divides the data into partitions corresponding to the reducers that they will ultimately be sent to. Within each partition, the background thread performs an in-memory sort by key, and if there is a combiner function, it is run on the output of the sort. 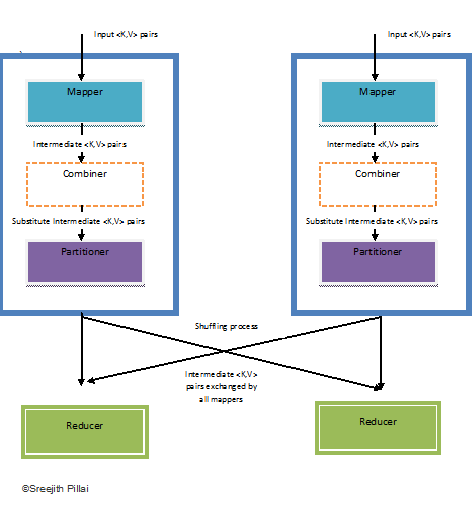 Combiners: Many MapReduce jobs are limited by the bandwidth available on the cluster, so it pays to minimize the data transferred between map and reduce tasks. Hadoop allows the user to specify a combiner function to be run on the map output—the combiner function’s output forms the input to the reduce function. Since the combiner function is an optimization, Hadoop does not provide a guarantee of how many times it will call it for a particular map output record, if at all. In other words, calling the combiner function zero, one, or many times should produce the same output from the reducer. One can think of Combiners as “mini-reducers” that take place on the output of the mappers, prior to the shuffle and sort phase. Each combiner operates in isolation and therefore does not have access to intermediate output from other mappers. The combiner is provided keys and values associated with each key (the same types as the mapper output keys and values). Critically, one cannot assume that a combiner will have the opportunity to process all values associated with the same key. The combiner can emit any number of key-value pairs, but the keys and values must be of the same type as the mapper output (same as the reducer input). In cases where an operation is both associative and commutative (e.g., addition or multiplication), reducers can directly serve as combiners. In general, however, reducers and combiners are not interchangeable. Below is the output stored in HDFS which is partitioned among two reducers: In same code I just removed job.setPartitionerClass(LogPartitioner.class); line and the output was different The difference between both output was the partitioned output was stored as per our requirement i.e. keys in range 8-18 was stored in Reducer 1 and rest keys in Reducer 0. But the later used HashPartitioner(Default Partitioner) to differentiate they keys in both files. could you please upload visible image for combiner and partition to understand clearly. There are some topic where complete explanation is not loading. Please help us with what is wrong.